I recently watched the recording of the fantastic Diversity, Equity and Inclusion session at OpenCon, and I was struck by the general theme of how ‘openness’ isn’t necessarily the force for equality that we perhaps think it is, and how issues of power, exploitation, and hierarchy means that it should be understood differently according to the context in which it is applied. In the session, Denisse Albornoz used the expression of ‘situated openness’ to describe how our Northern conception of openness should not be forced on anyone or any group – it needs to be understood first in individual contexts of historical injustices and post-colonial power structures. What stood out for me most in this session, however, (because it related most to my work) was Cameroonian Thomas Mboa’s presentation, which talked about the ‘neo-colonial face of open access’. The presentation employed some very striking critical terms such as ‘cognitive injustice’ and ‘epistemic alienation’ to Open Access. I’ve always known that the Open Access movement was far from perfect, but at least it’s moving global science publishing in the right direction, right? Can working towards free access and sharing of research really be ‘neo-colonial’ and lead to ‘alienation’ for users of research in the Global South? And if this really is the case, how can we ‘decolonise’ open access? Thomas didn’t get much time to expand on some of the themes he presented, so I got in contact to see if he had covered these ideas elsewhere, and fortunately he has, through his participation in ‘Projet SOHA’ . This is a research-action project that’s been working on open science, empowerment and cognitive justice in French-speaking Africa and Haiti from 2015-17. He provided me with links to four publications written in French by himself and his colleagues from the project – Florence Piron (Université Laval, Quebec, Canada), Antonin Benoît Diouf (Senegal), and Marie Sophie Dibounje Madiba (Cameroon), and many others. These articles are a goldmine of provocative ideas and perspectives on Open Access from the Global South, which should challenge all of us in the English-speaking academic publishing community. Therefore, I decided to share some excerpts and extended quotes from these articles below, in amongst some general comments from my (admittedly limited) experience of working with researchers in the Global South. The quotes are taken from the following book and articles, which I recommend reading in full (these are easily translatable using the free tool Google Translate Web, which correctly translated around 95% of the text). “… there are many debates in this community, including on the place of open licenses in open access (is an article really in open access if it is not freely reusable in addition to being freely accessible? ), on the legitimacy of the fees charged to authors by certain journals choosing open access, on the quality and evaluation of open access journals, on the very format of the journal as the main vehicle for the dissemination of scientific articles or on the type of documents to be included in institutional or thematic open archives (only peer-reviewed articles or any document related to scientific work?). … and their critique gets more and more scathing from here for the Open Access movement. OA advocates – tighten your seatbelts – you are not going to find this a comfortable ride. “… this attitude that drives us to want to think about local problems with Western perspective is a colonial legacy to which many African citizens hang like a ball.” Mboa (2016). 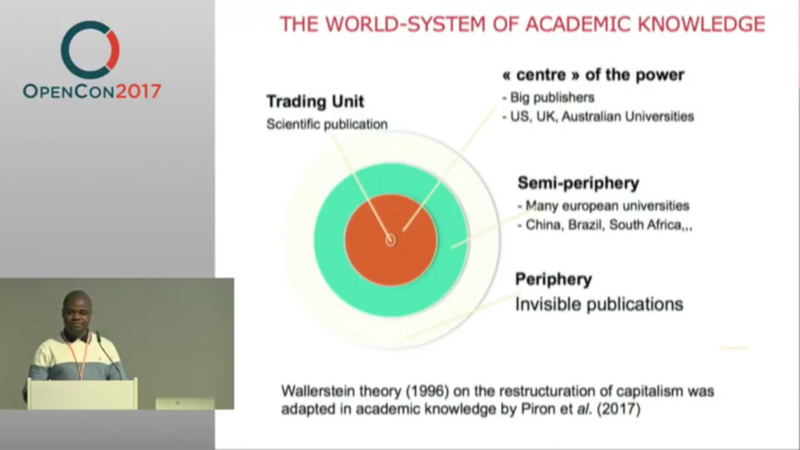 So where does Open Access fit in with this world-system? And whilst in the North we may have a lot of respect for different cultural perspectives, genuine reciprocal exchanges of research knowledge are rare. We are supremely confident that our highly-developed scientific publishing model deserves to be at the centre of our system. This can lead to selective blindness about the rigorousness of our science and our indexed journals, in spite of the steady drip drip drip of reports of biased peer review, data fraud and other ethical violations in ‘high-impact’ Northern journals, exposed in places like retraction watch. North/South research collaborations are rarely equitable – southern partners often complain of being used as data-gatherers rather than intellectual equals and partners in research projects, even when the research is being carried out in their own country. “These [Northern] partners inevitably guide the problems and the methodological and epistemological choices of African researchers towards the only model they know and value, the one born at the center of the world-system of science – without questioning whether this model is relevant to Africa and its challenges”. Piron et al (2017). These issues of inequity in collaborative relationships and publication practices seem inextricably linked, which is not surprising when the ultimate end goal of research is publishing papers in Northern journals, rather than actually solving Southern development challenges. The lack of equity in research knowledge exchange and collaboration is also caused by another one-way North to South flow: funding. Research in the South is often dependent on foreign funding. Big Northern donors and funders therefore set the standards and agendas in research, and in how the entire research funding system works. Southern partners rarely get to set the agenda, and researchers rarely get to develop the research questions that guide the research. They have to learn to jump through administrative hoops to become credible in the eyes of the Northern donor (for more information see ‘Who drives research in developing countries?‘). Southern institutions are also compelled, via league tables such as the World Unviersity Rankings, to play the same game as institutions in the North. Institutions are ranked against each other according to criteria set in the North, one of which is citations (of course, only citations between journals in the Web of Science or Scopus, which is overwhelmingly Northern). And so to stay ‘competitive’, Southern institutions need their researchers to publish in Northern journals with Northern language and agendas. Whilst it is tempting to think that the issues and criticism described above is mostly a problem for the social sciences and humanities, there are also real issues in the ‘hard’ sciences – perhaps not so much in their epistemological foundations – but in very practical issues of Northern research agendas. For example, Northern research, being based in Europe and the US, is overwhelmingly biased towards white people, in diversity of leadership, diversity of researchers, and most importantly in the whiteness of clinical trial subjects. This is problematic because different ethnic populations have different genetic makeups and differences due to geography, that mean they respond differently to treatments (see here, here and here). Are African and Asian researchers informed of this when they read research from so-called ‘international’ journals? “There is a definite bias in this approach as almost all of the guidelines and systematic reviews are based on the research carried out in high income countries and the findings and the recommendations have little relevance to the patients, health care system and many a time serve no purpose to the millions of patients based in low resourced countries. e.g. I routinely used Phenol blocks for spasticity management for my patients which were abandoned two decades ago in the West. Results are great, and the patients can afford this Rs 200 phenol instead of Rs 15,000 Botox vial. But, unfortunately, I am unable to locate a single systematic review on the efficacy of phenol as all published research in the last decade was only on the use of Botox in the management of spasticity.” Farooq Rathore (HIFA mailing list, 2016). These examples of innovation aside, there are many cases where the ‘epistemic alienation’ described above leads to ‘the exclusion or contempt of local knowledge’ (Mboa, 2016), even amongst researchers in the global South. The Research4Life (R4L) programme also comes in for criticism from Piron et al. which will come as a shock to Northern publishing people who often use the ‘… but they’ve got Research4Life’ line when faced with evidence of global research inequalities. Of course, the same could be said of Article Processing Charge (APC) waivers for developing country authors. Waivers are currently offered by the majority of journals from the big publishers (provided according to the same HINARI list of countries provided by Research4Life), although sometimes you have to dig deep into the terms and conditions pages to find them. Waivers are good for publishers to showcase their corporate social responsibility and provide diversity of authorship. However, they are unsustainable – this charity is unlikely to last forever, especially as they rely on the pool of Southern authors being relatively limited. It should also be noted that developing countries with the most active, growing researcher communities such as Nigeria, South Africa and India do not qualify for either R4L access or APC waivers. This also appears to be paying off in the Global South – authors seem resigned to pay some kind of charge to publish, and it is common to have to point out to authors that over two-thirds of OA journals and 99% of subscription journals do not charge to publish (although, the rise of ‘predatory’ journals may have magnified this misunderstanding that pay-to-publish is the norm). To build the path or take the path? This complaint about in-country communication from researchers in the South can be common, but there are signs that open access can make a difference – as an example, in Sri Lanka, I’ve spoken to researchers who say that communicating research findings within the country has always been a problem, but the online portal Sri Lanka Journals Online (currently 77 open access Sri Lankan journals) has started to improve this situation. This project was many years in the making, and has involved training journal editors and librarians in loading online content and improving editorial practices for open access. The same, of course, could be said for African Journals Online, which has potential to facilitate sharing on a larger scale. Arguably, some forms of institutional resistance to openness in the Global South have a neocolonial influence – universities have largely borrowed and even intensified the Northern ‘publish or perish’ mantra which focuses the academic rewards system almost entirely on journal publications, often in northern-indexed journals, rather than on impact on real world development. So what is the answer to all these problems? Is it in building the skills of researchers and institutions or a complete change of philosophy? “[Cognitive injustice comes via] … endogenous causes (citizens and African leaders) and by exogenous causes (capitalism, colonization, the West). The knowledge of these causes allowed me to propose ways to prevent our downfall. Among these means, I convened open science as a tool available to our leaders and citizens for advancing cognitive justice. For although the causes are endogenous and exogenous, I believe that a wound heals from the inside outwards.” Mboa (2016). it gives a better visibility to research work. By aiming to benefit from these advantages, researchers and African students fight cognitive injustice. For this, open access science relies on open access, free licenses, free computing, and citizen science.” Mboa (2016). Even if you disagree with many the above ideas, I hope that this has provided many of you with some food for thought. Open Access must surely be about more than just knowledge flow from North to South (or, for that matter the academy to the public, or well-funded researchers to poorly funded researchers). Those on the periphery must also be given a significant voice and a place at the table. For this to happen, many researchers (and their equivalents outside academia) need training and support in digital skills; some institutional barriers also need to be removed or overcome; and of course a few cherished, long-held ideas must be seriously challenged. “These injustices denote anything that diminishes the capacity of academics in these countries to deploy the full potential of their intellectual talents, their knowledge and their capacity for scientific research to serve their country’s sustainable local development”. Piron et al., (2016). Thanks to Florence and Thomas for double-checking the translations of their work from the French originals. The rest of the material above represents my own personal thoughts, and does not necessarily represent the views of my employer. 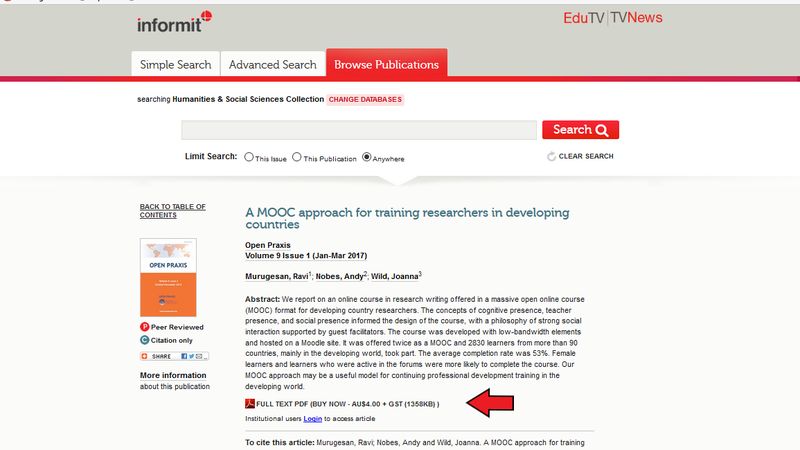 This year I published my first peer-reviewed paper as a co-author – a report on training developing country researchers using MOOCs. Navigating the co-authoring process with two of my colleagues was certainly a fascinating and character-building journey (and probably worthy of its own blog post) but in the end the paper was accepted after some revisions, and published in the March issue of Open Praxis, the journal of the International Council for Open and Distance Education (ICDE) (full text here). As a bit of an Open Access fan, it was great to be able to publish the paper in a fully Open Access journal which uses the Creative Commons CC-BY 4.0 licence. This ticked all the ‘openness’ boxes and, more importantly, we were confident that this would reach as wide a readership as possible. Following the excitement of my first publication, I had been eagerly awaiting our first citation (a little presumptuous, I know), so I thought I would check Google Scholar to see if the paper had any citations yet … and I stumbled upon a curious thing – the default hyperlink for the paper in Google Scholar wasn’t for Open Praxis, but something called ‘search.informit.com.au’. I followed the link through to what looked like some kind of Australian library website. And… wait… is that a PAYWALL? Imagine my surprise at seeing a charge of $4 Australian dollars for a copy of the PDF. No link to the journal, no indication that it was Open Access. Just a $4 charge (+tax). So how did our openly licensed paper advocating open courses, published in Open Praxis (a journal that champions open educational practices) end up behind a paywall? I had a quick look on the Informit website, which revealed that they are an Australian content aggregator website providing “...information management services to the education, government and corporate sectors“. In fact, the service apparently “…exists to preserve, enhance and distribute hard to find content.“, which is all well and good, but this isn’t hard to find content – our paper is the #2 result in Google Scholar if you search for “MOOC developing countries” in 2017. There are some fair points here. Yes, the paper is available free online, but for some inexplicable reason one of those sources links to their ‘added value’ paywalled version, and gives no other options to access the paper. And it’s fine for them to add metadata and categorise articles by subject, but that’s also what academic journals do. For example Open Praxis. However, having said this, the copyright holder may not have the right to ask for the content to be removed. The CC-BY licence allows other users to more-or-less do whatever they like with the content as long as the creators of the work are credited, or in the words of the licence itself, “The licensor cannot revoke these freedoms…”. But is this reasonable, fair use of the material? Not a good move! 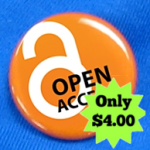 Open access is exactly that- open! Pippa’s example is the really interesting, similar-ish case of the enterprising ‘Samuel Barrack’ who repackaged a collection of World Health Organisation research papers and sold it as a book on Amazon. Because the works were licensed as CC-BY, this is perfectly legitimate and legal, even if the WHO aren’t particularly happy about it. We’ve rectified this and the article has been removed from Informit as requested. @ICDEOP is also now fully available as OA on Informit. 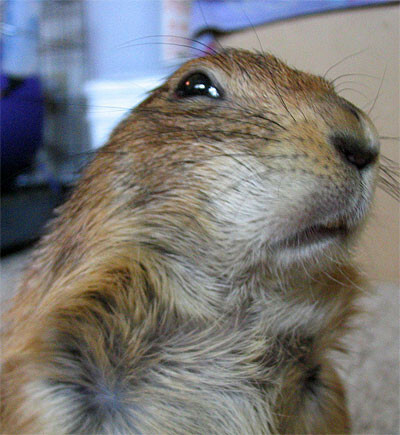 So the whole of the Open Praxis journal is now fully OA with no paywalls for Informit. Whether this was due to Ravi’s request or bad press, we aren’t sure. Informit backed down before we got the chance to test out a). the boundaries of legality and ethics of this kind of usage, and b). the rights of the copyright holder once his/her work has been published via CC-BY. Some problems remain, however – Google Scholar still points to the Informit version, which is an issue we will have to take up with them. Why did Google Scholar prioritise a commercial Australian aggregator website over the original, open source? This is potentially a very troubling precedent. Also, Informit appears to have removed the whole issue of Open Praxis that our article was published in, so the Google Scholar link is hitting a ‘page not found’ 404 page, which is still going to prevent people from getting to the paper. (This blog post is a task for the “Climate Change Mitigation in Developing Countries” MOOC being run by the University of Cape Town. The objective is to give an example of a ‘super-wicked problem’ and possible solutions). After the landmark consensus to cut the global official warming target to 1.5c at the Paris Climate Change Conference (COP21), all countries are under increasing pressure to convert these commitments into action. 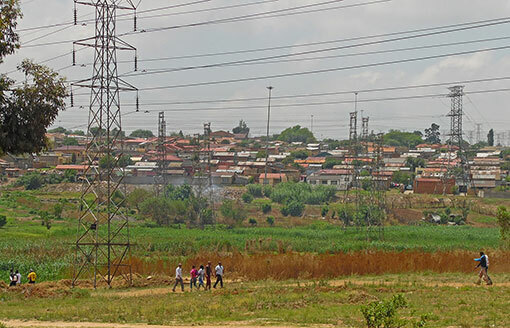 In the case of South Africa, as with most developing countries, this may hinge on making some big political decisions at the domestic level, as well as relying heavily on international aid and investment. South Africa is extremely energy intensive for a developing country – mostly generated from coal, which goes mainly into electricity and industry, or imported crude oil, which goes straight into fuel for transport, and so if South Africa wants to meet its INDC targets by 2030 (the Peak Plateau Decline Trajectory) it will need to switch pretty rapidly from coal power stations to green energy or nuclear power, and also switch its transport system to mostly electric by 2025. This is a big undertaking in itself, but as Hilton Trollip from the University of Cape Town pointed out in his recent interview with SciDevNet, there is a profound difference in opinion between climate scientists and big industry on whether this is actually possible without making sacrifices elsewhere. According to Trollip, economic modelling has demonstrated that it is possible to have economic growth, employment and income distribution AND reach their environmental targets. However, industry voices argue that there has to be a choice between either environmental action or poverty alleviation (through economic growth). Trollip calls this a battle between political statements vs. actual evidence. Big industry has more power over policy than climate scientists. Civil society groups are still in their infancy – they have won some small concessions – but just don’t have the power yet to challenge big industry and the political status quo. International aid is a double-edged sword. Funding for climate research comes exclusively from aid countries, but this is ultimately unsustainable. Those countries also push for economic development as the way to alleviate poverty, but through investment of their own firms in the country. For example, DFID has increasingly been pushing private sector investment as a way of increasing economic growth – this merely subsidises big business growth into developing country markets, and increases their influence over policy decisions in country. The private sector exists to make a profit, and therefore tends to invest in short-term profit through coal and oil, and does not necessarily invest in the domestic job market or community. South Africa needs to make urgent and radical changes to industrial and transport infrastructure, which will require significant policy change, but there are different actors with different priorities which conflict with each other – climate scientists, politicians, aid donors and big industry. This adds up to a ‘super-wicked’ problem with no obvious solutions, which likely means that neither policy change nor genuine poverty alleviation will occur anytime soon. Donella Meadows’ “Places to intervene in a system” identifies 12 leverage points for change in complex systems – for example the ‘power of self-organisation’. It’s possible that people will self-organise and mobilise, as they are already doing through civil society, but in bigger numbers – but this is difficult to predict and also engineer! The 2nd most powerful leverage is in changing the ‘goals of the system’. The goals of profit and economic growth mean that the private sector dominates the system and becomes the barrier to change – it is not in their interest to put radical change before profit. Changing the economic system may not be realistic, however. We may need to go beyond this and challenge the paradigm that human prosperity and security is through economic growth. The commitment of 195 countries to reduce emissions at the Paris climate conference may be the closest we get to a paradigm change – that even our world leaders now recognise a more urgent priority which trumps economic growth. However, it remains to be seen whether these grand statements will be enough to force urgent system change in developing countries like South Africa. Recent legal attempts by scientologists, ‘pastafarians’ and ‘jedis’ to have their beliefs recognised as ‘religious’ have put the spotlight on how vaguely ‘religion’ is defined in law, and how experts struggle to describe and categorise the diversity of beliefs in the modern world. Formal definitions put forward by theologians and social scientists are often too god-centred, or too vague to apply meaningfully to individual cases. ‘Religion’ has now become an umbrella term and a refuge for those with any passionately-held beliefs to seek protection and immunity from discrimination and abuse. At the same time it is also seen as an easy source of potential tax breaks, and inevitably it is often an object of mockery and parody. I propose that we need a more comprehensive definition of religion that can satisfactorily address the challenges of understanding religion in the 21st century, and to provide a consistent picture for lawmakers, philosophers and scientists as to what the substance and function of religion is, and what it is not. By looking at recent and historical case law verdicts, certain key themes emerge – these cases, which often concern discrimination and coercion claims, skirt the boundaries of what ‘religious beliefs’ mean to passionate individuals. What seems crucial to identifying genuine religion is not only whether beliefs are genuinely and sincerely held, but also the strength and centrality of those beliefs for those individuals (i.e. their ultimate concern), which has a significant impact on how they act or indeed refuse to act. However, religion should not be seen as purely subjective – it cannot be something that exists just in the minds of one person. By looking at the existing definitions by theologians and social scientists, the challenge to traditional theocentric definitions caused by non-theistic religions and new religious movements is obvious. However, the most insightful definitions, like those of the law courts, touch on both substantive and functional aspects, and several key themes emerge. Firstly, religions are systems of multiple symbols and ideas. Secondly, they contain an unverifiable and counterintuitive element at their core. Thirdly, they ultimately influence human motivations and actions on a very profound level. I argue that the key to pulling all these threads together into a logical whole is found in combining two concepts; one ancient and one modern. To begin, I discuss the Mahayana Buddhist concept of ‘skilful means’ – a uniquely pragmatic, goal orientated method of teaching. I look to Shin Buddhism as an example of a religion that seems to be self-conscious of the fact that once all the usual religious and symbolic content is stripped away, only skilful means remains. I discuss the origin of skilful means as a self-conscious revelation; how it uses unverifiable claims to achieve a goal, or transformation; and how all religions are to a lesser or greater extent types of transformative teaching tools, and therefore all types of skilful means. The modern aspect of the definition I propose is that of the memeplex – a successfully self-grouping and self-replicating systems of ‘memes’ (uniquely human ideas, which are often altruistic and cooperative at their core). Once accepted and established in the human mind, the memeplex is self-sustaining and self-serving, and has an extremely powerful hold over the individual, and ultimately groups of individuals, often causing them to act in counterintuitive ways. Drawing these ideas together, I propose that religion is a memeplex of skilful means. 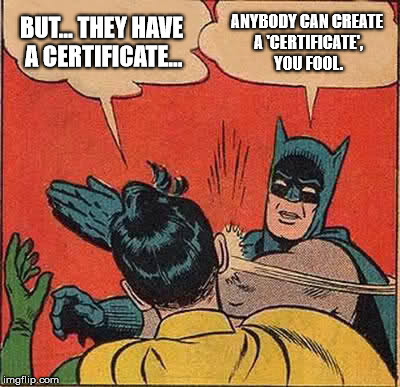 By this I mean that it is a self-replicating system of ideas and symbols with unverifiable claims or narratives that are designed (or naturally selected) to transform the behaviour of individuals and groups of people in significant and permanent ways, usually to the benefit of the system itself. This definition describes both substantive (multiple related ideas and their unverifiability) and functional (transformative, group cooperation) aspects of religion. I also argue that thedefinition is neutral towards religious or supernatural claims. Finally, I demonstrate that this definition provides a tangible means to analyse new and existing philosophies, movements and cults. The definition can be broken down to a three-point checklist providing a basic level guide to whether something can and should be considered ‘religion’. I apply this critically to contemporary movements from Scientology and ‘Pastafarianism’ to more contentious examples like nationalism, football and even Christmas. To assist in categorising these phenomena, I propose a matrix of religion and non-religion, where some of these beliefs can also be categorised as ‘memeplexes of non-skilful means’, ‘non-memeplexes of skilful means’, or ‘free memes’.